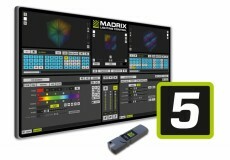 MADRIX® 5 is all about speed, performance, creativity, and, of course, our users. “Customers who saw a preview version prior to the release already expressed their excitement to see their most common requests included. We are really happy that the MADRIX® Software is universally loved by our users for letting them pixel map quickly and easily in 2D or 3D. MADRIX® 5 definitively takes LED lighting control to the next level”, says Christian Hertel —MADRIX® Sales Manager. The new 64-bit software architecture is the biggest performance boost the software has ever seen since the first version in 2005. You can control more pixels, output more universes, create more effects, and use more layers. In addition, it is not necessarily required to deploy new hardware in order to take advantage of the speed upgrade. The new software will also improve any compatible system that is currently in use. The user interface has been completely revamped to make it even faster and easier to use. Two themes, dark and light, graphical improvements, and new visual clues allow for even quicker operation. New effects and filters make sure you get the visual results and lighting design you are looking for even faster. VJing will be more creative thanks to the new capabilities to directly play back the audio track of videos. CSV Import and Patch Editor Background Image features allow for much faster set-up times of your project. Fixture list imports that use the CSV file format can quickly generate complex patch layouts based on data of third-party software, such as visualizers, consoles, CAD software, other lighting design tools, or even manually created data. The range of MADRIX® 5 Licenses now starts at and has been doubled to 2 DMX universes, and ranges up to 2,048 universes of DMX-based output. Every license now also includes DVI-based output, ranging from 4,096 pixels up to Full HD with MADRIX® 5 KEY maximum, which is the new high end. All in all, MADRIX® excels in versatility by supporting over 50 industry control standards for output alone plus many more for input and remote control. Existing users can benefit from software update packages for MADRIX® 2 and MADRIX® 3.